Why Be Curious? Ultra-traditional Barolo from a producer who’s been doing it that way for decades. Extra years of aging in botti grandi and then in bottle before release, plus library releases held back for even later release. Produttore / Producer: Antica Casa Vinicola Scarpa has been producing traditional wines in the Monferrato hills of southeast Piemonte since 1854. But it was Mario Pesce, admired by both Giacosa and Gaja, who made Scarpa’s reputation in the second half of the 20th century. Traditional sometimes means ‘rustic’, but that’s not the case here. A very present gusto della casa (house style) produces elegant wines with arrow-like acidity and well-aged tannins. In the 21st century, Scarpa continues to produce each year small quantities of more than a dozen wines from 10 different grape varieties and to release gradually wines from its ample library of bottles going back to the 1960s. Vigna / Vineyard: Tettimorra comes from a 1.0 hectare vineyard near the village of La Morra, between the crus of Bricco San Biagio and Roggeri (i.e., near Arborina). The elevation is about 300 meters. 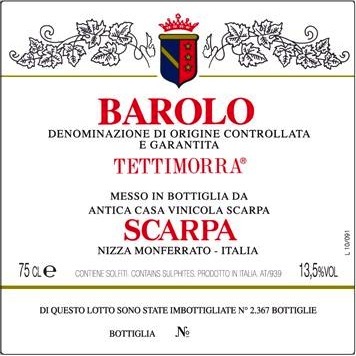 The name means “the roofs of La Morra” and follows the name of Scarpa’s Barbaresco vineyard, Tettineive. Il Vino / The Wine: This is Barolo the way it used to be made — where structure, spices, and minerals are at least as important as fruit. The extra aging in cask and in bottle results in a wine that is released when it’s at least beginning to show the qualities that make a Barolo worth drinking: secondary aromas and flavors and the complexity that comes with age. In most vintages, the wine will continue to improve for years, if not decades, but if you drink it upon release, at least you won’t be committing infanticide. A Tavola… / At the Table… In Piemonte, this is the wine that you drink at special meals with important secondi — i.e., main courses, especially of meat. It’s especially good with braised meat, game, lamb, and mushrooms (truffles above all!). Or enjoy it as a vino da meditazione at the end of a meal, with a generous hunk of aged cheese such as Parmigiano Reggiano. Ettari / Hectares: 1.0 hectares. Quota / Altitude: 300 m / 985 ft.
Vitigni / Varieties: 100% Nebbiolo. Età delle viti / Vine age: 30 years old. Fermentazione alcolica / Alcoholic fermentation: About 28 days in large, truncated conical wooden tanks. Élevage: Minimum 48 months in large French oak casks (botti grandi) ranging from 2,000 to 10,000 liters and from three to 12 years old, plus at least two more years in bottle before release. Gradazione alcolica / Alcoholic %: 13.5-14.5%. Tappo e bottiglia / Closure and bottle: Natural cork, 750 ml modified Burgundy bottle embossed with the Scarpa logo.